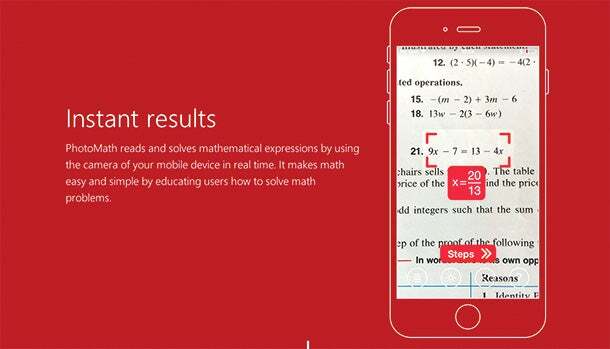 This Free App Solves Math Problems for You. Well, Mostly. Clever photo calculator app + math = problem solved. Instantly. Oh, yeah, kids, it’s real and it’s finally here, but not without a few kinks. Behold PhotoMath, a new free photo calculator app that solves math equations in a snap -- a snap of your smartphone’s camera. For free. How sweet is that? You do the math. Actually, you don’t. That’s the whole point. Step 1: Launch the app and aim your smartphone at a math equation. Step 2: Align the (homework, duh) problem you want to solve within the app’s little red frame brackets, watch a sprinkling of animated white dots sparkle while the app thinks for a second or two or three -- and Boom! Voila! -- the answer automagically appears on the screen. Well, at least it should and most of the time it does. We’ll get to that wet blanket in just a minute. PhotoMath’s genius doesn’t end at the solution. To see each step used to unravel the equation, just tap the word “Steps” that appears on your smartphone screen. Yep, it’s that easy, a no-brainer. Cue the collective mirth of math haters everywhere -- and the collective ire of math teachers the world over. The refreshingly clean and simple app, in both user interface and in functionality, is only available for iOS devices and Windows Phone for now. Sorry, Android people. No PhotoMath for you. Not until sometime in early 2015, according to its creators. Before you download the app (because you know you want to, corner cutter), know that it’s not all rainbows and unicorns. PhotoMath’s makers boast that their wonder product can crack basic arithmetic, fractions and decimals, powers and roots and linear equations, all in a single click. And, for the most part, it can. But it can’t solve handwritten or word problems -- nor, get this, a fourth-grade California Common Core Math Standards Practice Book problem we tried it out on. Unfortunately the app mistook a simple division problem from the workbook for a square root problem, then, of course, spit out a square root problem answer. Wrong! If you’re a fourth grader, you probably wouldn’t realize that PhotoMath gave you the wrong answer. And, when you turn your math work in, your teacher might get the sinking suspicion that you’re calling in some serious tech backup to get your homework done (a.k.a. cheating). Uh oh. Our PhotoMath test drive wasn’t all bad, though. We also tried it on several eighth-grade algebra problems (also California Common Core issue) and it worked every time -- much to a certain 13-year-old’s delight. However, we had to significantly brighten the lighting around the math worksheet that we aimed our iPhone 6 at to coax the app into taking a clear snap, even after tapping the app’s light icon.